Theorigin of internet influencers or key opinion leaders (KOLs) can be traced backto the heyday of the internet, when we browsed homemade blog posts onXanga.com, blogger.com and other personal content-sharing platforms forleisure. Soon after, we noticed some bloggers standing out from theircounterparts. Associal media rose to new heights in popularity, this new breed of digitalcontent creators, especially ones who wrote about beauty, food, travelling, andleisure, quickly stole the limelight in the public arena. 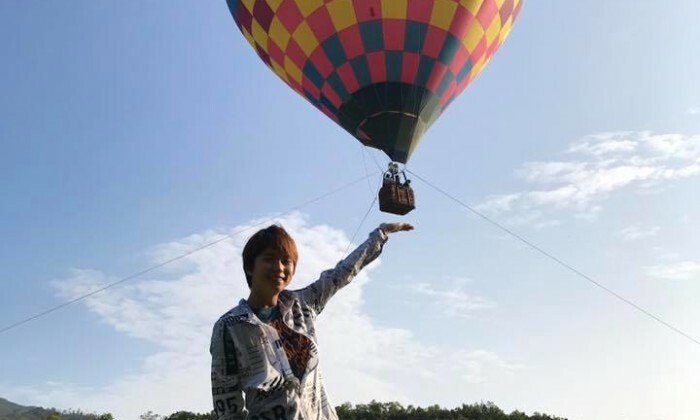 InHong Kong, for example, internet celebrity Tat Goh has amassed more than114,000 fans on his Facebook page and 86,000 YouTube subscribers on his channel“UndergroundDV” for his daily live-gaming shows. Hisrising fame attracted attention and landed him an opportunity to front ExpediaHong Kong’s digital and traditional commercials. Sponsorships from differentbrands contribute to him being able to make a full-time living as a key opinionleader. In 2014, he was even appointed vice-president of mobile gamedeveloper Ever App. TheKOL business is so profitable and promising that former news anchors and bothmajor and minor celebrities are using their public social media accountsto share sponsored and non-sponsored posts to interact with their readers. Andit’s not just booming business for the KOLs themselves; brands are also excitedabout the new trend. Quickly looking through Hong Kong’s YouTube adsleaderboard shows that the majority of brands have hired familiar online influencers for their ads. 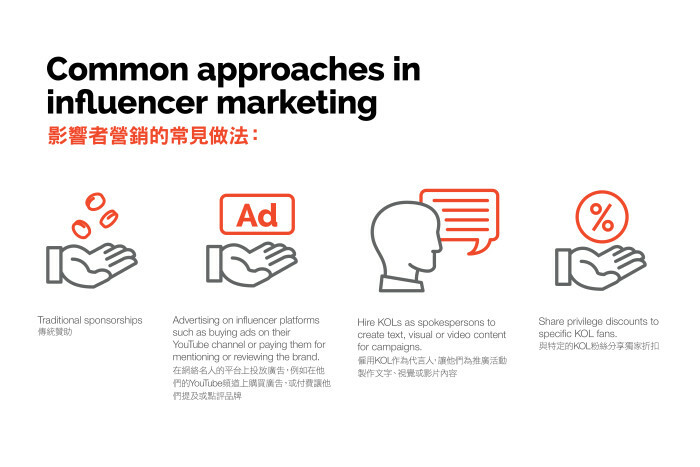 DBSBank (Hong Kong) is one of the brands that actively embraces influencermarketing.It has increased its online and social media budget from 30% to about50% of its total marketing budget in three years. GlendyChu, executive director and head of group strategic marketing andcommunications, says infl uencer marketing is not only part of the bank’soverall strategy, but one that has proven quite effective. DefiningKOLs as social media influencers who have a large group of fans who help brandsboost social media engagement, she says DBS started testing the waters ofinfluencer marketing with some of its branding campaigns in 2014. She says,eventually, that it “does serve as a smarter way to reach the customers”. Inone of its campaigns, the “Igniting Possibilities Sparking Joy” series, thebank teamed up with local influencers such as Daisy Wong to regularly spreadthe brand message that everyone should free themselves from their dailyhassles, and discover their opportunities at the heart of who they are. “Wedecided to ride on the trend when we saw more KOLs in product launches, and wedid see its value,” she says. “Celebritiesmay help brands to reach mass audiences, but KOLs are different in the way theydeepen the reach. While KOLs usually make public their stances and attitudes,their followers usually pursue similar beliefs. Similarly,Wai Loi, marketing director for Huawei Hong Kong’s consumer business group,said Huawei has invested more of its marketing budgets in social mediapromotions. It began hiring more influencers as spokespersons for its gadgetlaunch campaigns last year – and it’s seeing good value for money. 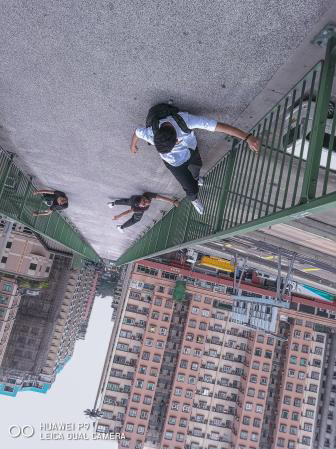 Inits launch campaign for Huawei P9, the brand tapped Six Dimen Boy, severallocal Instagram photographers and actor Simon Yam to create visual stories forHong Kong with the smartphone to highlight the capability of its camera. Waisays the appeal of influencers just seems more authentic since the message iscrafted in their own words and images. Another upside of influencer marketing,she adds, is the brand can track and measure the strategy’s viral power,sentiments of its audiences and digital engagements in real-time to maximisethe benefits it receives. “TakeFacebook as an example. We can analyse the post by tracking its clicks, actionsand engagements, which helps us better evaluate how effective that particularKOL is to our campaign,” she says. VincentTsui, chief marketing officer at Next Mobile, says brands in Hong Kong have twocommon approaches when it comes to a partnership with KOLs. On the one hand,brands support KOLs with traditional sponsorships or by buying advertising ontheir platforms, such as buying ads on their YouTube channel or paying them formentioning or reviewing the brand. Brandscan also pay a higher price to get KOLs to create text, visual or video contentfor campaigns. The price is either proposed by the KOLs themselves, or bysocial media agencies, a new concept business that gives brands access toseveral influencers, celebrities or micro-celebrities in packaged offers. Anotherway, he explains, is to share privileged discounts to specific KOL fans, whichmay help brands track the digital creators’ sales reach. 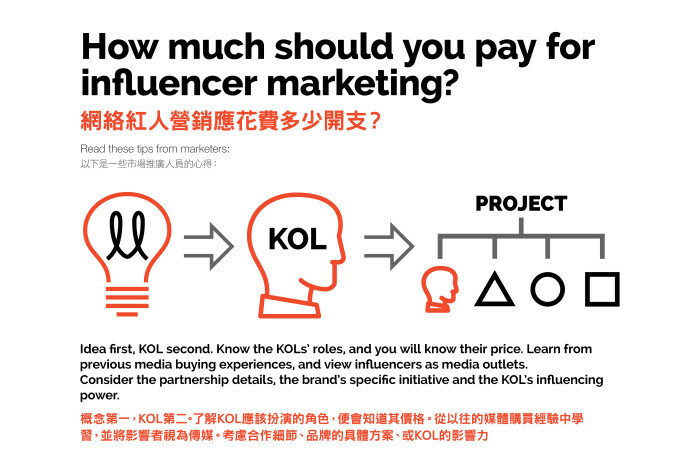 Sponsorshipfor each social media post varies from several hundred dollars to HK$100,000 ormore, and pricing considerations include the KOL’s duties in the partnership,his or her reputation and the scale of the KOLs’ fan base. Under usualpractices, the more effort it takes for the KOL to create the original brandedcontent, the more expensive the post is. “Theredoesn’t seem to be a clear consensus as to how much it costs,” Tsui said. StephenChung, director at boutique agency Secret Tour Hong Kong, agrees that answeringhow much an influencer should be making for a YouTube video or an Instagramphoto is a convoluted matter. “KOLsare no longer just confined to bloggers or popular Facebook page admins, butalso celebrities or printed media outlets who have established social mediapresences,” he says. Hesays he has witnessed a surge in the cost of influencer marketing over the pasttwo years, and the cost peaked in December 2016. In an extreme case earlierthis year, an influencer agency proposed a whopping HK$800,000 fee for gettinga famous entertainment influencer to shoot a video for one day. In an extreme caseearlier this year, an influencer agency proposed a whopping HK$800,000 fee forgetting a famous entertainment influencer to shoot a video for one day. Heelaborated that while influencer marketing is not a total stranger to clients,some brands which are new to this still rely heavily on agencies to decide howmuch to pay influencers. An oft-quoted figure based on a poll of marketingprofessionals conducted by Tomoson two years ago, tells us that businesses aremaking US$6.5 for every US$1 spent on influencer marketing, but with morebrands adopting the tactic for branding and engagement, the calculations ofreturn on investment of influencer marketing have become more complicated. Asthe market grows in maturity, Chung has seen a gradual decline in the cost ofinfluencer marketing between January to March 2017. “More brands realise thatinfluencer marketing does pay off, but it boils down to what your company islooking for,” he said. Whilethe above might make it seem like KOL strategies offer a silver marketingbullet, there are concerns in the implementation of KOLs at scale; especiallywhen done indiscriminately. “LikeMSG in a bowl of noodles, one or two ‘drops’ helps to enrich the flavour, butyou wouldn’t add MSG to every bowl of noodles you see. The noodle type andingredients matter,” Chung explained. Like MSG in a bowl ofnoodles, one or two ‘drops’ helps to enrich the flavour, but you wouldn’t addMSG to every bowl of noodles you see. The noodle type and ingredients matter. NextMobile’s Tsui suggested marketers learn from their previous media buyingexperience to decide if the tactic is really worth the price, as influencersare very much like media outlets. An influencer is like anindependent TV channel. Marketers judge if the media-buying strategy iscost-effective by reviewing the TV ratings, but the ratings themselves can’texplain everything. Themarketing team should first conceive the campaign and then strategise on thedistribution of the campaign message across different media channels. In suchcases, an influencer is simply one of the “media outlets” to promote the brandmessage. Headded that the media-buying theory also justifies the prediction thatinfluencer marketing will continue to grow over years. Movingforward, DBS’ Chu expressed concern over the lack of choices in the influencermarket. “Sometimesyou see the same faces at different branding campaigns,” she said. Thebank prefers calling their influencers “thought leaders” instead of “KOLs”, asthe influencers they co-operate with are not always digital creators. Huawei’sWai saw the same problem, but the brand tackled it by building relationshipswith the same influencers. “Insteadof buying several sponsored posts on social media, we want to build long-termpartnerships with influencers and give them true experiences with the brand,”she says. Whilefor Huawei this strategy seems to be working, marketers would do well to keepscaling in mind when approaching a KOL strategy. 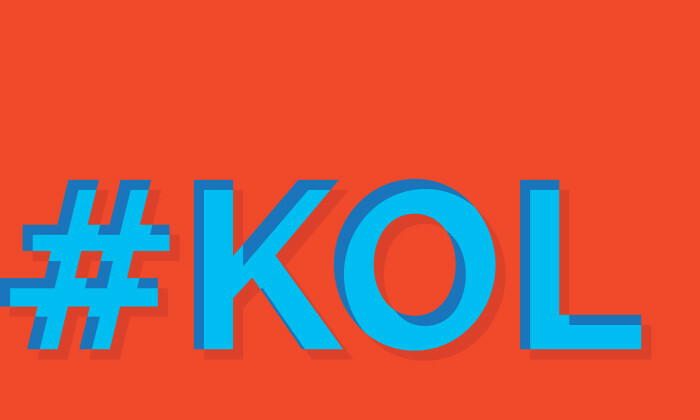 It can be incredibly labourand cost-intensive to work with KOLs on creative, striking deals with them andscaling that content across platforms and media outlets. SiuSee, the founder of the Facebook page “Fly For Miles”, provides miles-relatedtravelling tips regularly. With more than 82,000 followers on social media, heknows a thing or two about influencer marketing. Hesays brands have started changing their mindsets, and are now requesting him tobe more creative content-wise. Acrossthe pond in the US, meanwhile, poor execution of KOL tactics have led toscandals such as when Scott Disick – a celebrity related to the Kardashians –was caught simply copy-pasting instructions from sponsor Skinny Tea last May,while video game Youtuber Pewdiepie got his sponsors in hot water foranti-semitic content in his videos late last year. Whileit can be argued that the above can be avoided with careful vetting andplanning, marketers should be very conscious of the relationship between thecontent created by the influencer, and what demographic that content appeals to– it has to be in-line with the overall marketing strategy, and identifyingsimply ‘millennials’ as your target audience is simply not enough for effectiveinfluencer marketing.